The excess in the B0 search might also be simply a systematic effect, as the background situation is quite different for the B0 compared to the Bs. 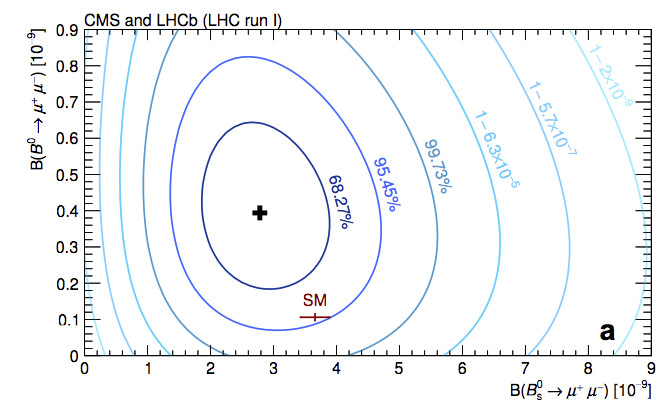 While it seems to be fair to say that the CP violation data from kaons, neutral B mesons and neutral D mesons, is consistent with the SM explanation of a single CKM matrix CP violating phase; the MOE on that is quite large (the two SD range is like 60 degrees wide), and IIRC, some of the measured CP violation in D mesons in even of the wrong sign and takes some contortions to reach the right theoretical estimate which is like 50-100 times as great as the naive estimate with too many simplifying assumptions in the calculation. I'm a bit surprised that this isn't a more fruitful area for BSM physics articles (not that there aren't some proposals out there). 50-100 times? There were some delta A_cp measurements larger than expected (~factor of 5), but the central value went down again with more data, and theory prediction went up with more work done (and the uncertainty estimate got better). The value is difficult to predict, but theory and experiment look consistent again now.